Born out of a Closing Gaps Monitoring and IT Officer’s need for improved team coordination and document version control, the platform has since been expanded to the whole program. The system is designed to track progress on quarterly implementation plans, and provides each regional office the ability to define, monitor and document activities regarding their individual quarterly plans in one place. Users can define which program will be using the tool, the objectives of the program, parameters for the implementation plan and indicators specified in the program contract. The platform makes it easy to closely track the implementation plan, ensuring that if all plans recorded in the system are complete, the program will reach its indicator targets with ease. A view of the shared calendar interface. 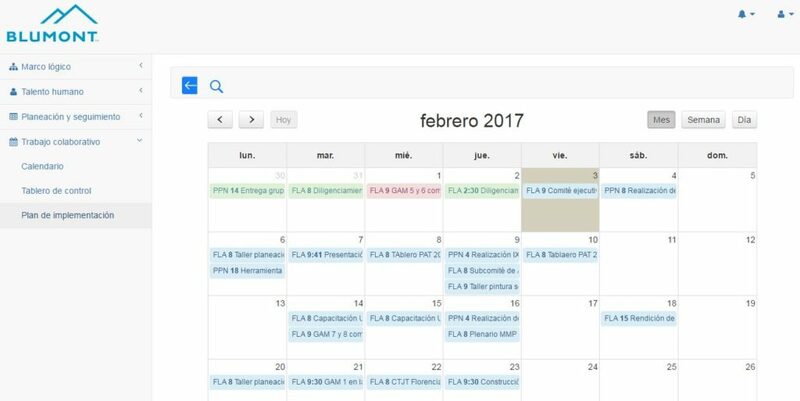 Included in the interface are a shared timeline and calendar which display the status of tasks alongside their assigned staff member and supporting documentation. Project managers can then take a bird’s eye view of program activities at any time to determine if they are on schedule. With this tool, managers can solve problems before they start, as information housed in the system allows them to react quickly and effectively to developing situations. A view of the implementation plan interface. Each regional office in Colombia has received training on the program, and Closing Gaps Operations Director Juan Pablo Franco says all individuals working with the project – psychologists, nurses, logistics officers, regional coordinators, etc. – have been able to engage with and benefit from this simple, user-friendly tool. To learn more about what our Closing Gaps program is doing in Colombia, click here.